Sometimes in the course of my non-Wednesday life, I do visit new bars, and for various reasons, I know I won’t return for an official Wednesday Cocktail Adventure. But, that doesn’t mean all good, bad & ugly of ’em don’t deserve a little mention on 52 Martinis. 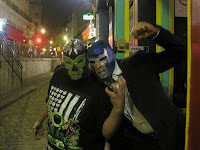 And, so we have the case of La Lucha Libre. This unusual night spot has been on my radar for awhile, but I just never got around to it. I got an additional nudge to try it by Paris food blogger, Adrian, via egullet. 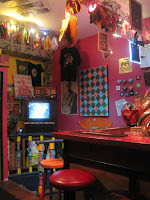 Melanie and I stopped into the festively colorful La Lucha Libre a few weeks back on the hunt for some tastily-bad-for-you bar food and margaritas. The 8 – 10 Euros cocktail menu features about 20 choices – including ‘bling bling’ cocktails and an assortment of flavoured mojitos. I opted for a margarita and Melanie had the Kunilingus (yeah, I know, I rolled my eyes at the name of this fruity vodka concoction, too. But it was much more amusing to me when some guy offered to buy Melanie another drink & asked her what she was having). Our 17 Euros assorted tapas platter came bearing jalapeno poppers, chicken wings and various other deep fried tasties. And, the guys running the show here are extremely friendly. Always a plus if it's someone else doing the silly things instead of me.